MELBOURNE- It’s the Melbourne equivalent to New York’s twin towers. The city’s reputation as the skyscraper capital of Australia is set to be boosted after a Chinese developer lodged plans to build a twin skyscraper complex on Queen and La Trobe Streets. 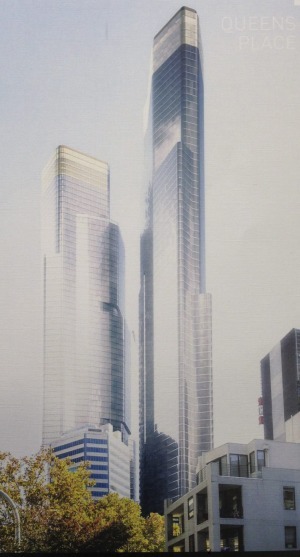 Just six months after buying the massive corner site for $135 million, a company called 3L Alliance has submitted plans for two soaring 79-level towers at 350 Queen that will stretch far higher than the nearby 55-level Melbourne Central building on Elizabeth Street. The completed towers at 267.8 metres (878.6 ft) will be just 29 metres shorter than the city’s current tallest building, the 92-level (297-metre or 974.4 ft) Eureka tower completed in 2006. The city’s latest high-rise proposal follows hard on the heels of a series of other super-tall structures in planning or under construction, fuelled by an offshore-driven apartment boom. Another landmark tower in Southbank is set to rise 81 levels, or 259 metres (849.7 ft), on the corner of City Road and Clarendon Street. It will be taller than Southbank’s newly-completed 72-level Prima Pearl building, but shorter than the country’s tallest building, Australia 108, which is expected to rise 100 levels, or 319 metres (1046.5 ft), on the same side of the Yarra River. The fresh proposal is likely to test newly-elected planning minister Richard Wynne who recently rejected another high-rise apartment planed by Grocon for 85 Spring Street. 3L Alliance’s structure at 350 Queen will cost $750 million to build and will include a public plaza, a creche and nearly 2000 square metres (21527.8 sq ft) of retail space. The towers will stand behind KTS House, a 21-storey office that will remain on the site. The structure will dwarf its immediate neighbour, the tiny Welsh Church building. 3L Alliance is controlled by Chinese nationals Baoyu Li and Lin Xiong. The pair purchased the site, known as KTS House, in October last year from a private Malaysian investment group Kinetics ­Properties, a subsidiary of Sarawak-based lumber company KTS Holdings. A supermarket on the corner of Queen and A’Beckett​, a two-storey car park facing A’Beckett​ Street and several single storey retail shops on La Trobe Street will be demolished to make way for the new tower complex if it gains planning approval. KTS House has a chequered development history. It was constructed in a joint venture between local developer Warren Anderson and Japanese groups Shimizu​ Construction and Itochu​ in 1990 during a particularly speculative, over-supplied period in Australia’s commercial property market. The project became mired in an acrimonious dispute between the parties before the Japanese retreated, selling the project without completing key parts. The towers will have about 1700 apartments with resident facilities that include four large swimming pools, saunas, spas and gyms, a home theatre, communal kitchens, karaoke rooms and a dedicated yoga studio. The “sculpted” buildings have been designed by Cox Architecture and Fender Katsalidis​ Architects. ← Did you know the Confederate States of America is celebrated in Brazil?